Richie, Donald. Tokyo: A View of the City. 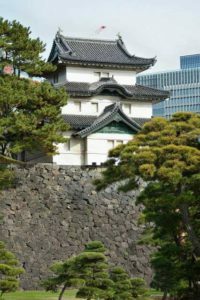 The Imperial Palace of Japan was originally Chiyoda Castle, home of the Tokugawa Shoguns. Its groundwork was laid 140 years before the arrival of the Tokugawa, by Ota Dokan, a retainer of a branch of the Uesugi clan. 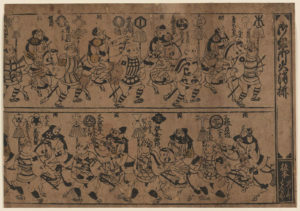 Ota Dokan as depicted in a print by the late Edo woodblock artist Toyohara Chikanobu. Note Edo castle in the background. A map of Chiyoda castle in 1636. 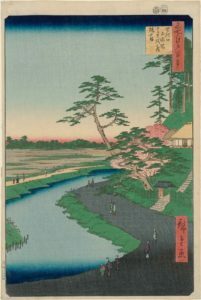 Edo as depicted by Hiroshige. Note the west-facing orientation towards Mt. Fuiji. 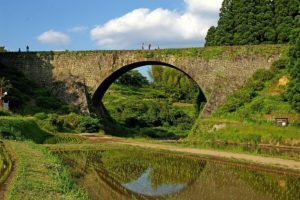 The Tsujun Bridge, an acqueduct in Kumamoto, Kyushu. It’s a good example of what the acqueduct construction of Edo would have looked like at its height. The Tamagawa Acqueduct, depicted by Hiroshige. A procession of firefighters (machibikeshi). C. early 1700s. 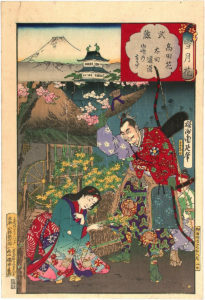 The Meireki Fire was the most devastating fire in Edo’s history — and would retain that title until the fires associated with the Great Kanto Earthquake of 1923. I find that very interesting about the street plans in Tokyo vs. Kyoto. I remember that when I visited those cities I thought Tokyo made no sense getting around by foot. Had I not discovered that feature where you can orient yourself on Apple Maps I’m really unsure about how I would have managed (I know I definitely spun myself in circles getting from Shinjuku station to my hotel). 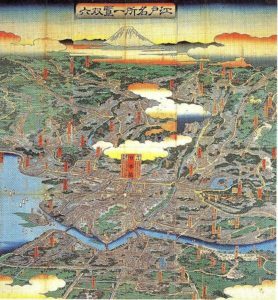 I thought Kyoto was more “American” because our cities tend to have that nice and simple grid pattern while Tokyo felt more “European” because it was sprawled about. Switching gears: how were the various fire fighting units in Edo funded? Were they like a modern publicly funded fire department or was it something like a privately funded company? Were the firefighters volunteers, conscripts, or professionals?